The next time you’re wondering how many grams of sugar are in that donut and if it’s going to cut into your allotted daily calorie intake of junk food, just pull out your iPhone or iPad and ask Siri. 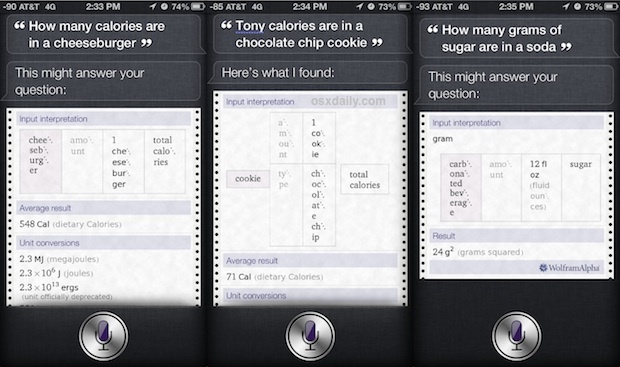 Thanks to Siri’s ability to tap into the wealth of knowledge at Wolfram Alpha, you can use Siri to retrieve detailed dietary information. Like anything else that tracks and estimates calories and dietary contents of food, some assumptions are made on the size and quantity of items, so don’t expect Siri to know the cheeseburger you are asking about is actually a triple pounder with 15 pieces of bacon wrapped in a donut bun. Also, Siri makes some assumptions on the caloric usage of activities based on averages of body weight and size, when those numbers will obviously vary per person and on their physical condition. The things you can do with Siri continues to expand into more useful categories, expect this trend to continue as Siri evolves into a more and more meaningful assistant. Pretty cool but you’re going to get some very inaccurate info for the more general “cheeseburger” type inquiries. how many calories are in a cheeseburger from kuma’s corner vs a cheeseburger from McDonald’s?